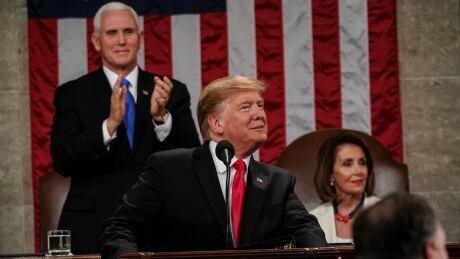 U.S. President Donald Trump mentioned Canada just once during his State of the Union address this week, but that single mention pointed to an internal battle in the Republican party over what to do about trade barriers. Relations between the two countries have been rocky, especially after tense trade negotiations and the mutual introduction of hefty tariffs. Canada isn't the only country that has fallen from grace with Washington. The U.S. has been engaged in a trade war with China, with both nations slapping tariffs worth billions of dollars on each other. Tariffs are one of Trump's favourite weapons; he is now seeking to impose the U.S. Reciprocal Trade Act, which would allow the president to raise tariffs based on duties charged on American products by other countries. However, senators from his own party are fighting it and are condemning the tariffs on Canadian steel and aluminum. There's also the matter of ratifying the new NAFTA deal that was reached in the fall. "I think the members of Congress from both sides of the aisle are right that you've got to lift these tariffs before Congress will ratify the agreement," Maryscott Greenwood, the CEO of the Canadian-American Business Council, told CBC's The House. Greenwood said she thinks the reciprocal tariffs bill won't pass the test with key Republicans. "Not only will that not get passed through Congress but, actually, I think the opposite will happen," she said. "They are saying, 'Look we think you're abusing national security statute to try to get leverage in trade deals and we feel like everybody else that that is entirely inappropriate.' So I think his wings are going to get clipped."